I'll be back Monday - I hope you all have a wooly holiday. I'll leave you with a preview of a little somethin'-somethin' thats fresh off my needles. Its a product of these, and perfect timing too - I really need something to keep my ears warm these days. I'll post 'officially' when I get back. If I'm really in a good mood, I might even make up a pattern for it (no promises, though). Gorgeous! What a great blog you have going on here. Beautiful photography and impeccible knitting. I'm greatly inspired by you! Jarrett has been added to my project list for my husband after seeing yours. Love it. simply beautiful!Wow. Happy Thanksgiving to you and yours. Safe travels! I really like the way you patterned the colors. I liked the combination when you showed the picture of the yarn earlier, and now it looks like you have a lovely new FO. Can't wait to see it finally unveiled! 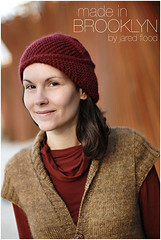 The hat looks great, I love the top decreases! Have a good trip, and a Happy Thanksgiving! ahhh colorwork. I never get sick of seeing it! The colors you chose look wonderful together! Have a great holiday out west! Hope it's warmer wherever you are headed! I'd love to get the pattern. Please!!! Hope you have a Happy Turkey Day!!!! get lots of knitting done and some cough sketching cough! Happy Turkey day to you too! Lovely hat! I look forward to the pattern. Think it'll be ready in time for Christmas knitting? Beautiful! Have fun on the west coast for Thanksgiving. I will be in New York briefly (for a layover at JFK, fun fun fun). May you knit peacefully and pleasantly on the plane. Happy Thanksgiving! And safe travels, too. 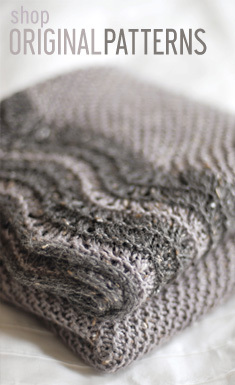 I have been swimming in fair isle projects and loving them all! Have a great Thanksgiving out here in west land! Now THAT'S at hat! Happy Thanksgiving! i LOVE those colors together - unexpected and the pattern is really cool. ! i think you must be one of the most productive knitters ever. happy thanksgiving & have a great trip! Beautiful use of colour - looks almost variegated. I've only been reading your blog for a short time, but already I've come to expect this signature look of bold, rich colours sumptuously photographed. I am so impressed with all your knit projects. You are amazing. HAve a great Thanks Giving. Great colors! It's beautiful. Show us more! If you can, can you describe how you did the decreases on the top? I like the effect you got. My gosh, such amazing colors - and your photography is stunning as always! Beautiful colours. I'm so impressed. Do you knit in your sleep? Yummy colors. Have a lovely vacation! Absolutely stunning. Beautiful colorwork, tell me how you do it! 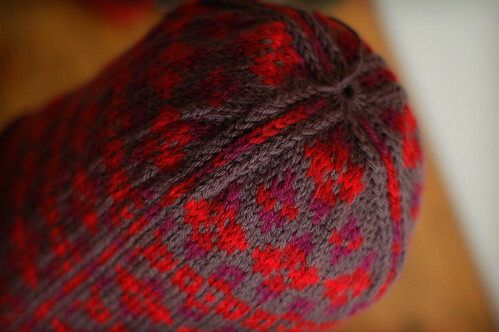 I love hats that have that type of decreasing on top that forms a pattern. Makes the top looks so "finished". You have such excellent color sense, Jared. It looks terrific, and I love the decreases! please make a pattern up for this. :) it's lovely!! i love the decreases! Oooh, I love that hat ... please do the pattern for it! I need something gorgeous to start colour work with. Great color combination. I'd love to hear more about the pattern..
Gorgeous. I hope you had a nice holiday. you have a good eye for color. you could color consult on other people's knitting projects! All I can say is–––ohhhhh,ahhhhh! Excuse-me, I don't speak english. I have my blog and I love your visit. Perfect timing...it is freezing outside! It looks fabulous inside and out! i love the color palette of this - and the decreases are delightful. looking forward to the pattern! What a great pattern. Thank you so much! A guy who knits. Difficult projects (and successfully completes them). With very even stitches. And who comes up with pretty cute designs of his own. You know, somehow this bugs me as a female knitter. :D Just kidding. By the way, what camera are you using?